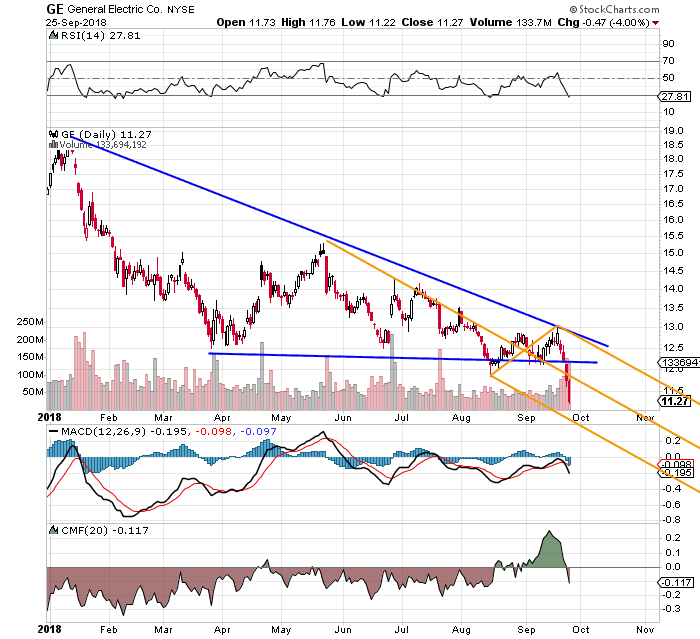 GE is the one stock that I both want to buy and short, depending on what time of day it is. Earlier this year, I purchased for my family a new washer and dryer from General Electric (GE - Get Report) . Our old ones were nearly twenty years old, and for the most part neither washed nor dried our clothing. The good news is that everyone in the family is very happy with the new appliances. I really am quite surprised at how far washers and driers had come since before the turn of the millennium. I also bought the stock of GE this summer -- even after it took the risk management effort of my career to turn a profit on a long position in GE held from late 2016 through early 2018. That is, if you call preserving one's principal and maybe adding bus fare "a profit" after more than a year of effort... and financial engineering. The shares closed down 4% in Tuesday trading, and have retreated a rough 12% in a week's time since problems started showing up for the firm's gas turbines involving the lifespan of single blade components. Uh Oh. Sept. 20 was also the day that J.P. Morgan cut its price target for GE from a lofty $11 to just $10. Stephen Tusa, the J.P. Morgan analyst who just keeps on being right about this firm, cut his 2019 EPS estimate for GE by a nickel, and commented on how little wiggle room the firm has for negative news flow. I read somewhere that from 1963 through 1975, fifty U.S. service members were killed by tigers in Vietnam. Encounters with dangerous wildlife are fairly common in the infantry. The man vs. tiger encounter was played upon in the movie "Apocalypse Now," when the character "Chef" leaves the boat and searches the jungle looking for mangoes. Once safely back aboard their "Swift Boat," Chef declares that he will never again leave the perceived safety of that craft. The same wisdom possibly could have been applied to the idea of investing in General Electric. But that is water under the bridge, at this point. Hence, the time has come to manage another lousy position in GE. Thankfully, the size of my long in this name is rather pedestrian -- compared to the last time that I let myself realize that I had wandered into a minefield. I really can not complain. My average price is $13.16 for the equity, and factoring in the puts that I have written against this name, my net cost basis is $11.24. At a last sale of $11.27, one might say that I do not yet have a problem. That said, my short put positions are rising in value and could put me in a position to have to purchase more equity at what might be a disadvantageous price when they expire in December. Obviously, the name is not cheap enough to make further equity purchases attractive, and flattening my options positions now will force my basis considerably higher. It does not take a whole lot of cognitive ability to understand what happened when the downward-sloping trend line met up with the support base. Of course, this event coincided with the recent news cycle, which has been severely negative for the firm. The Pitchfork does suggest that a new level of support could emerge somewhere between $10.75 and $11 within the month of October. That is, assuming no new negative headlines appear -- and you know what happens when we assume. This is the one stock that I both want to buy and short, depending on what time of day it is. I certainly will not consider adding new equity at any price sporting a handle above "ten." I will not give up completely, because Tuesday's beat-down in particular did have the scent of capitulation about it. Maybe. Maybe not. What I would like to do is write some calls against my equity long, but you know what? GE will report their third quarter the morning of Thursday, Oct. 25. There are no options valuations attractive enough at this point to make a sale worthy, at least not to me. In fact, December $14 calls only paid $0.08 Tuesday night. The $13 calls paid a whopping $0.16. Kind of reminds me of an investor with no hope screaming in a place where no one will hear. When expected volatility is so low that making a sale does not make sense, what can one do? That's right. Buy the volatility. That's where the risk/reward is. Good for you. I'm glad that you thought of that on your own. Best part.... this will cost "but a song." Lose the whole ball of wax? So what. Taking my family of four out for McDonald's (MCD - Get Report) would cost me more. Should the shares trade between $10.50 and $12 through the evening post-Flannery's earnings call, the trader is out $36. Big deal. Should the action between now and that call push shares more than $0.75 to $0.80 in either direction by that expiration... well then, we have a ballgame. At the time of publication, Guilfoyle was long GE equity, short GE put options.